The famous Egyptian Museum houses the largest collection of ancient Egyptian artifacts in the world ( more than 120,000 priceless Egyptian antiquities). It is located in downtown Cairo on the north side of Tahrir square. Inside this great dome, you can find the mesmerizing treasures of Tutankhamun, mummies, jewelry of great pharaohs, and items belong to those ancient Egyptians. It is opened for the public from the 15th from November 1902 to witness the amazing culture and heritage of the ancient Egyptians. This magnificent building was founded in Bulaq in 1858 but it suffered from the flood of the Nile in 1878, moved to Giza in 1891 and stayed there until 1902, and then moved to its current location in Tahrir Square. It represents everything about the great history of the ancient Egyptian civilization, especially the pharaonic and the Greco-Roman periods. It includes more than 100,000 unique pieces, and among them there are 1,700 items from the tomb of Tutankhamun, the grave mask of king Amenemope ”from the 21st dynasty”, the mummy mask of Psusennes I, the colossal statue of Amenhotep III and Tiya, figurine of Khufu, a statue of Khafre, Narmer palette, Merneptah Stele, a statue of Menkaure, and the gold mask of Tutankhamun. 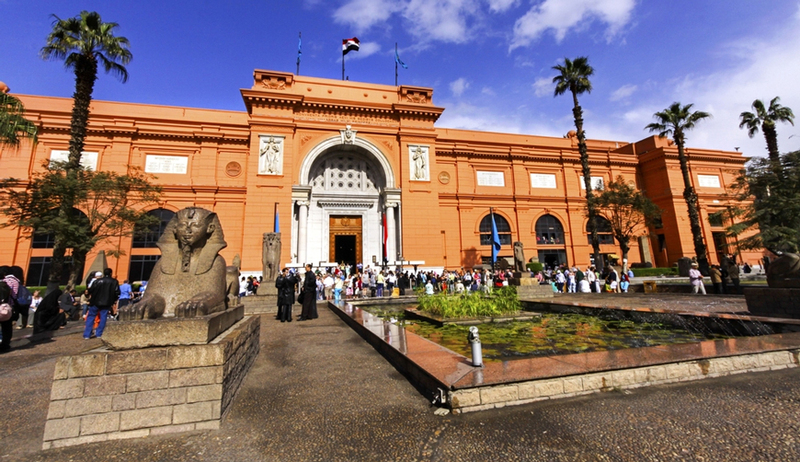 The Egyptian Museum tries to represent the magnificent Egyptian heritage to all people around the world as it helps them connect the past with the present in one place. Most items in the Egyptian Museum are more than five thousand years old. It is actually called the Museum of Egyptian Antiquities. It consists of the largest collection of the Egyptian antiquities. This astonishing building was built by the French architect, who is called Marcel Dourgnon. There is a hall in the Museum that hosts eleven royal kings and queens. More than 1.5 million tourists visit the museum every year. Every month a new artifact is featured for tourists to see. The Museum has two floors, the ground floor has 42 rooms, whereas the first floor has 47 rooms. The ground floor consists of a collection of papyrus and coins used in the ancient time. There are also some artifacts from the new kingdom. The 1st floor includes two massive statues of Ramses II and Amenhotep III with his wife Tiya, who are from the final two dynasties in Egypt in addition to some items from the tombs of the Pharaohs Thutmosis III, Thutmosis IV, Amenophis II, and Queen Hatshepsut. There are also some artifacts from the Valley of The Kings. King Tutankhamun was one of the kings of the 18th Dynasty. He ruled the New Kingdom of Egypt from 1334 until 1325 B.C. There are invaluable items inside the Egyptian Museum belonged to the great king Tutankhamun. Those artifacts were discovered between 1922 and 1927 and we can sum those items to a surviving throne chair that dates back to ancient Egypt. Inside the tomb was a chariot that is pulled by horses, and some weapons including swords, daggers, arches, and bayonets. There are three golden coffins of King Tut Ank Amun, two of them displayed inside the Egyptian Museum and one of then wights more than 110 kg. The other coffin displayed in the Valley of the Kings in Luxor. There is also the golden mask of this great king that weighs 11 kg, that considers being the most famous item in the Egyptian Museum which is decorated with precious stones. About 32 statues of Tutankhamun were discovered by the archeologists in addition to the afterlife gods. More than 143 golden items were also discovered, ornamented with priceless stones, where you can witness these breathtaking treasures during your Egypt tours packages. One might expect that as long as Ramses was from the final dynasty of Egypt then his tomb must have a lot of treasures and priceless items but no…. His sarcophagus was simply a coffin made of wood and, when archeologists opened his tomb in the 19th century, they found it empty with no treasures. So we must ask a very important question here… Was the tomb of Ramses II stolen? The Egyptian Museum is a treasure for the Egyptian civilization as it shows the amazing architecture mixed with the historical culture through its artifacts, treasures, monuments, and palettes and reveals a lot of secrets about the ancient life of the Egyptians.